As part of my ongoing research, I've been reading the very interesting diaries of Elizabeth Steele Wright, which are held at the Library of Congress. In what I have read so far, Wright, her husband, and their dog Growler traveled via horse and coach around the southern United States in the late 1840s. Most of my research heretofore has been on steam travel, so I've enjoyed learning more about the mechanics of this different type of travel (although, unfortunately, the reason for their travels is not quite yet clear at this stage of my research). One issue which comes up again and again is the question of overnight lodging: when the sun went down, where would the Wrights and Growler rest for the evening? They appear to have stayed with strangers when deep in the rural South, lodging with local families wherever they happened to have stopped for the evening. Wright scrupulously recorded in her journal the names of the families with which they lodged and the amount which the Wrights paid the morning they departed. Although she didn't hesitate to comment on the poor quality of food or beds, she never mentions any haggling over the amount paid. There appears to have been a common understanding between travelers and locals: travelers would be taken in, but would willingly pay the amount asked the next morning. The amount paid could vary. The night of December 23, 1848, the Wrights stayed with a planter who owned thirty slaves in rural Georgia. The next day, they departed and "our bill was nothing." With another family in January 1849, they awoke their temporary host from his drunken stupor and paid him two dollars. Later that month in Atapulgus, Georgia, they paid one dollar and had "no fault to find with the bill." In rural Alabama that February, "we had a first-rate breakfast. the lady put up a fine luncheon for us our bill was only two dollars. where we get the best fare there they are moderate with their bills." But not all the meals were appetizing. When staying with a widow and her two daughters elsewhere in rural Alabama, Wright reported that supper "consisted of corn bread, fried ham, and eggs, coffee without any cream or sugar. I think if we had to drink coffee that way, that we would not drink much." The Wrights never seem to have had trouble finding a place to stay, but they were clearly dependent on the kindness of the people they encountered along the way. During one stretch of their journey, the Wrights drove through 25 miles of "barren country, with only now and then a house." The Wrights stopped at a house, and the lady there noted that she "did not like to take us in as her husband and servants were away, but the next house was five miles ahead, so she said that she would not turn us away." In larger towns the Wrights could find hotels, but most of their lodging was with private families along their route. These families appear to have put them up mostly without complaint, and the Wrights in turn paid what was requested upon departure. Elizabeth Wright's journal provides a marvelous window into this tacit understanding between traveler and host. In March 1910, the University of Illinois library received a bound set of the first sixty volumes of the American Railroad Journal from A. H. Grant of Elizabeth, New Jersey. Grant's stationery proclaims him to have been a "Dealer in Technical Periodicals Only" ("Services Prompt - Prices Reasonable - Terms Cash"). Grant closed his letter asking that the library make the "earliest possible remittance, as I had to pay cash, not an easy matter at this time of year." One hundred years later, the university partnered with the Internet Archive to make these same bound volumes available over the internet. I found the volumes (including Grant's letter, scanned in the the first volume) through HathiTrust, a staggering collection of online materials from a consortium of research libraries. HathiTrust takes the time and effort to get the metadata correct, meaning that searches can be executed with Library of Congress subject headings and a host of other methods. D. K. Minor began publishing the American Railroad Journal in January 1832. At the time, railroads powered by steam were hardly a sure bet. Yet Minor believed that the time was right for a journal dedicated to internal improvements. He made his goal clear in the very first issue, stating that he wanted to "diffuse a more general knowledge of this important mode of internal communication, which, at this time, appears to engage the attention of almost every section of the country." The American Railroad Journal was an exceptionally important resource for me when writing Railroads in the Old South, since I could mine its pages for evidence that southern railroad developments were engaged in a broader, national conversation about internal improvement. Minor's journal existed during the nullification controversy and the run-up to the Civil War, allowing me to judge how railroad promoters balanced sectional politics with their goals of a national system of internal improvements. At the time of its publication, Minor's journal was read all over the country, as the lists of subscribers printed in the journal attested. Now that the journal is available on the internet, his goal of "diffus[ing]" knowledge about railroads is even easier to accomplish. While I don't regret the time I spent hunkered over the microfilm version of the journal when I was researching my first book, I am certainly glad to see that this critical source for U.S. railroad history available online. Additional reading: Frank Luther Mott, A History of American Magazines, volume 2, 1850-1865 (Cambridge, Mass. : Belknap Press of the Harvard University Press, 1938), pages 297-300 covers the history of the journal. See also "One Hundred Years with the Railroads," Railway Mechanical Engineer 105 (October 1932): 385-392, 401. In two weeks, I'll be presenting a paper at the annual meeting of the Nineteenth Century Studies Association in Fresno, California. My paper is entitled "Images of Steam Transportation in Popular Culture," and it will include some my new research on images of steamboats and railroads in the antebellum era. I do not have a great deal of experience with analyzing visual culture, so I'm looking forward to the opportunity to get some feedback at this conference on my initial take on what some of these images mean. When I was doing the research for this project, I was overwhelmed by the number of transportation images I found. They are everywhere: on currency, in children's literature, on broadsides, in comic almanacs, on sheet music—everywhere. 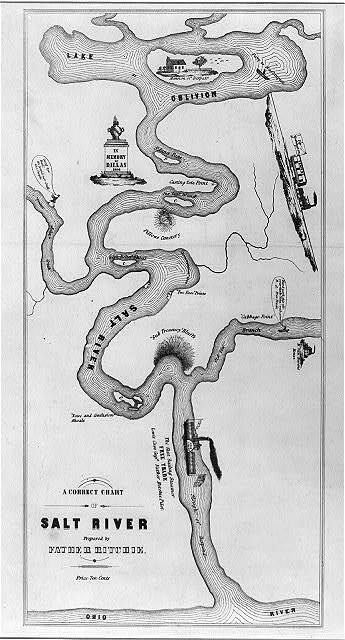 For Americans in the antebellum era, the phrase "Salt River" had the implication of a foolhardy journey, with a particular connotation in politics: during the 1832 presidential campaign, a pro-Andrew Jackson boatsman took rival Henry Clay literally "up Salt River," causing him to miss a speaking engagement (this from Liz Hutter's very nice essay "Ho for Salt River!"). This particular broadside mocks the problems which besieged Democrats during the election year of 1848. Candidate Lewis Cass is represented by a steamboat. Such a boat would seem to be an appropriate way to travel against the current, as the drawing depicts. But the boat is marked "free trade," a reference to Cass's opposition to high tariffs. Cass is about to face a series of disasters: Noise and Confusion Shoals, Santa Anna Pass, and eventually the Lake of Oblivion. By contrast, the (protectionist) Tariff of 1842 puffs ahead on a train, taking the direct route to Washington. Train tracks lead directly to the destination, avoiding the complex geography that awaits the steamboat. Images of steam transport were common throughout the antebellum era. In this broadside, we see both types of transport recruited to make a political message: Cass's free trade about to navigate difficult waters, while the tariff has a direct route to the capital city. Additional reading: For more on Cass, see Willard Klunder, Lewis Cass and the Politics of Moderation (1996).